THE SKINNY: After a long run, I am gross. Plain and simple. So gross that I don't even want to climb back in the car. Enter body wipes. 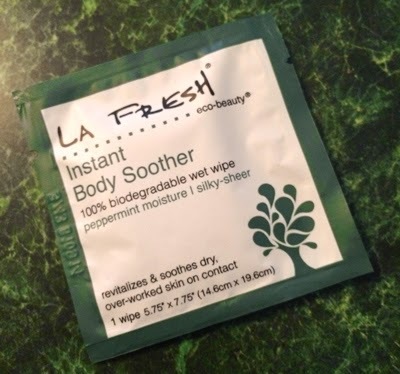 La Fresh Instant Body Soother Wipes are some of the ... um, well ... freshest wipes I have tried. The cooling wipes have a wonderful peppermint fragrance that smells and feels clean. The wipes are designed to soothe skin with six oils and are part of the brand's eco-beauty line, meaning the wipes are biodegradable, compostable and made with solar energy practices. So you will feel good and feel good about using this product. I also especially like that you can buy these wipes in a pack of 24 or pack of 18 individually-wrapped wipes (great for keeping in the car). CHECK IT OUT: La Fresh has an impressive line of wipes for almost any situation. Save 15% off your order with code GOLAFRESH15.